I think this highlights how seriously French people take their food. Lunch at the school canteen here is a three course meal with four different types of cheese, coffee and even wine for the teachers! It has been a pleasure to try so many local delicacies here in Brittany. The main speciality of the region is galettes, savoury crêpes made with brown flour. 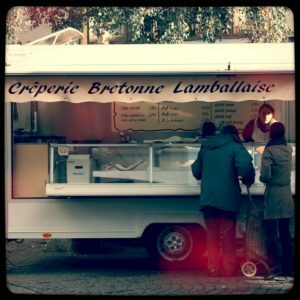 Even the smallest of crêperies will have lots of varieties of galettes, with fillings like ham, cheese, lardons, spinach, eggs and onions. The most popular here is galette saucisse, a galette with Breton sausage. Last weekend I visited the nearby city of Rennes, and we ate some galettes saucisses at the Christmas market, le marché de noel. We also drank some cidre chaud, hot cider, another regional speciality – the Breton equivalent of mulled wine! People here like to drink Breizh Colatoo, a soft drink similar to Coca Cola. Unfortunately (depending on how you see it!) another side of living in Brittany is the weather – that really meaning, rain! At least I never feel too far from home. This week, as we were waiting for the pupils to arrive, a teacher said to me, ‘Il pleut des cordes, aujourd’hui,’ which is another little expression, like saying ‘it’s raining cats and dogs.’ It’s meant to signify that the rain looks like cords falling down from the sky, which I guess makes more sense than our English expression! I hope you enjoyed this post, and à la prochaine!